So here's part two of my weekend recap. There was just too much to share for one post. 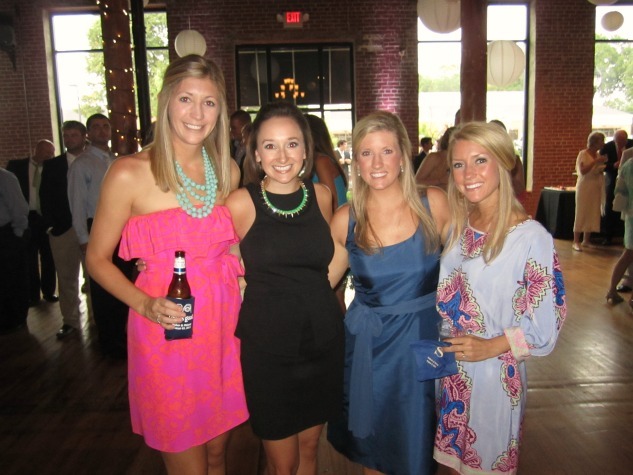 Saturday night we went to the wedding of our friends Melanie and Bishop. 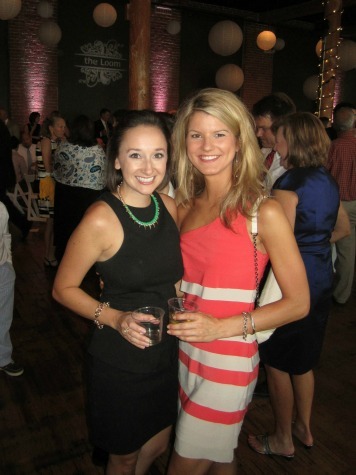 The reception was held at The Loom in Simpsonville. Melanie had her mom's wedding dress remade for her wedding day. It was beautiful and had such an amazing story behind it. 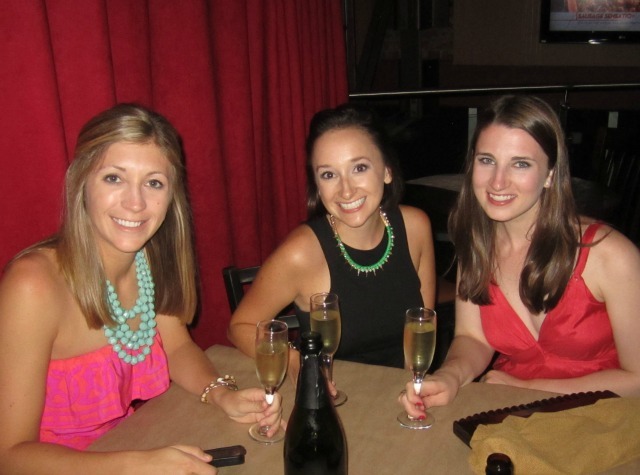 After the wedding we came back to Greenville and went to the bar at Nose Dive for a few glasses of bubbly. Then made a quick stop at McDonald's and came home. The 24-hour Mickey D's we pass on the way home from downtown gets me in trouble every time. 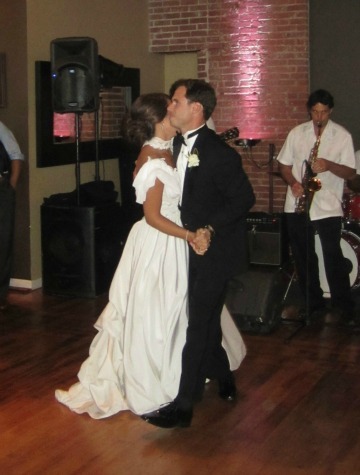 The wedding reception was beautiful and we had an absolute blast dancing the night away. Sunday night T and I were just not ready to see the weekend end, so we headed to Falls Park for a picnic. 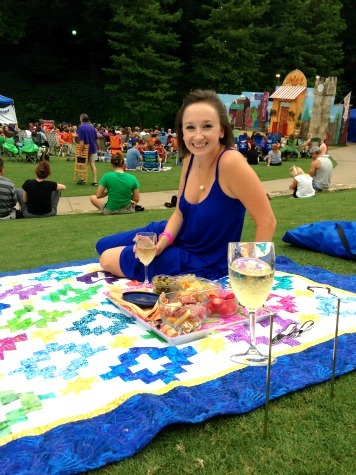 This Sunday was the last night of the Upstate Shakespeare Festival, a free event put on by the Greenville's Warehouse Theater. We watched A Comedy Of Errors as we shipped on champagne and munched on cheese and salami. Like any Shakespeare play, we had a little bit of a hard time following along, luckily their was a rather detailed synopsis of the play in the program. We paid $1 each for wristbands which allowed us to drink in the park and made a small donation to the Warehouse Theater after the play was over. I'm so glad that we went. We just don't enjoy Falls Park enough, and this gave us the perfect excuse to do that. For high school graduation my Aunt Karen gave me this quilt. Every child in my family gets a personalized quilt when the graduate from high school, its a little tradition we have going. My sister April wrote about her lovely quilt a few weeks ago in this post. I love the bright and cheery colors of mine, and I swear I did not mean to color coordinate my dress to the quilt- it was a complete accident! 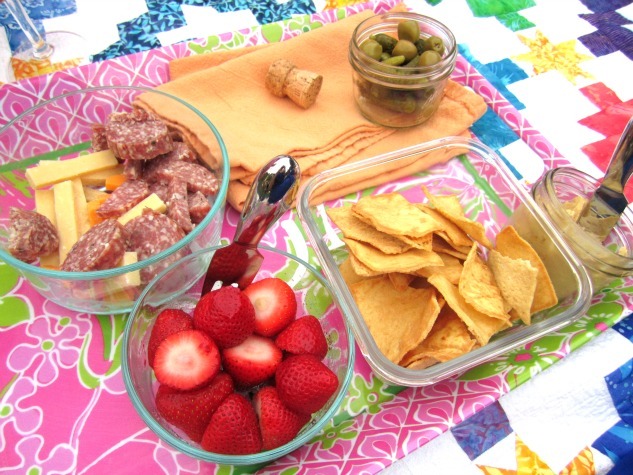 For our spread, I served sliced salami and cheese, hummus and pita chips, cornichons and green olives, and some strawberries. 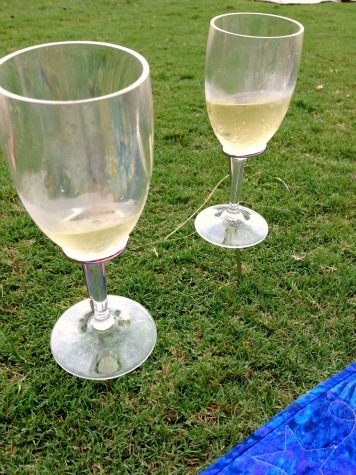 Last Christmas T's mom gave us these great wine glass holders for picnics. We were finally able to put them to use on Sunday, and they were great. They have a long steak that goes into the ground, and your glass just hangs off of the top. I loved that we got to stay in Greenville this weekend. We'll be on the road every other weekend until mid-October so we savored every moment that we had. Those wine glass holders are brilliant! Do you know where I can get some? I agree with the commenter above! I need some of those glass holders! 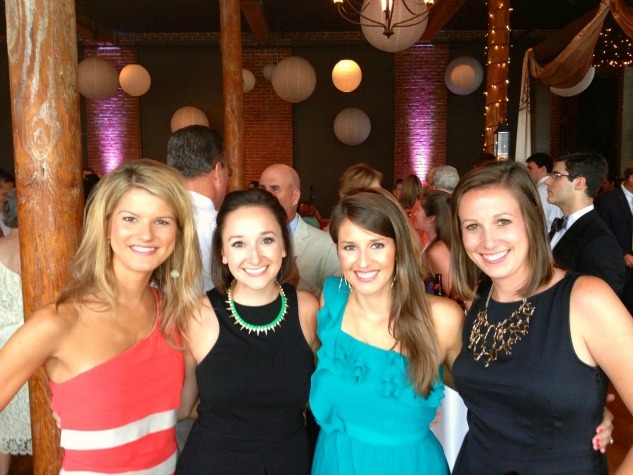 Sounds like you all had a lovely weekend... wedding weekends are the best! I love Falls Park! Definitely one of my favorite places ever. OH and I totally almost got married at The Loom. But they never called me back with an estimate. Sad day!